When Disney released the film “Big Hero 6” in 2014, audiences immediately fell in love with Baymax, the “personal healthcare companion.” Designed for no other purpose than to improve healthcare, Baymax not only appeared as non-threatening and approachable as possible (he’s described as a “giant marshmallow”), but was also programmed to respond to sounds of human distress and provide care for that distress, whether it be a recommendation for more sleep, a bandage, or something more advanced. While the plot of “Big Hero 6” took Baymax to superhero levels by giving him a rocket fist and the ability to fly, the idea of artificial intelligence (and even robots) making their way into healthcare isn’t quite as farfetched. 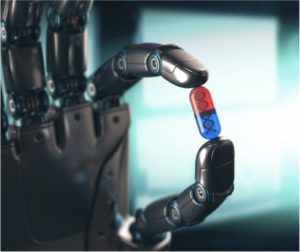 In fact, in many ways, Disney and Baymax provided a glimpse into the future of healthcare, one where artificial intelligence may actually be an important part of any healthcare plan. For many people, the idea of artificial intelligence is something limited to Hollywood movies and science fiction novels, but the fact is, most of us use AI every day. How many times a day do you perform a search on Google, or give a command to Siri or another “personal assistant” program? Whenever you do, you are using AI. INTERESTED IN READING MORE ON EMERGING TECHNOLOGIES? CHECK OUT “THE ETHICS OF AI” BY POINTCLEAR’S CTO NEAL EVANS, PHD. AI, in the simplest terms, is a digital device’s ability to recognize and understand objects or commands, and respond and make decisions based on what it “knows.” AI relies on vast amounts of data, typically stored in the cloud, to analyze what is happening and respond accordingly. Over time, as a user interacts with a device, it collects more data, which allows it to adjust its “thinking” and behavior, and thus become more useful. Telehealth. We are already seeing significant advances in the realm of telehealth, and the idea of seeing a doctor via a video conference or online consultation is becoming a more widely accepted option. AI, however, has the potential to take these consultations even further. Imagine that your child has an earache in the middle of the night. Instead of rushing to the ER or waiting in agony until morning, you may be able to snap a photo with a smartphone and upload it to an AI-managed server, which will analyze the photo and provide advice on how to proceed — or even make a diagnosis and order a prescription for you. AI is already being tested in telehealth robots working in hospitals, as well. Patients in rural hospitals, or those who need to see a specialist who isn’t local, may soon have the opportunity to see a real doctor via computer. 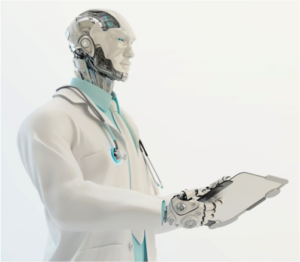 These robots, which are equipped with video screens and advanced computers, use AI to maneuver through crowded hospitals and conduct “rounds,” with the actual doctor appearing on the screen and using information from the electronic health record to review a patient’s progress and make decisions. Electronic health records improvements. AI has the potential to improve the use of EHRs in healthcare as well. For example, the voice recognition technology has advanced to the point where physicians will soon have the ability to take notes while speaking directly to the patient and looking them in the eye — not while typing on a computer. And by using cognitive computing systems like IBM’s Watson Artificial Intelligence, physicians will eventually be able to make faster and more accurate diagnoses – and develop better treatment plans — when patient data is instantly compared to all of the billions of other patient histories and up-to-date medical research. Eldercare. Caring for older adults and those living with chronic conditions will also become more efficient and effective with AI. While again, there are predictions of personal care companions moving into homes to help patients with daily living tasks and monitor their health and well-being, on a smaller scale, AI is already being incorporated into wearables and other healthcare devices. For example, many diabetics wear insulin pumps that automatically alert them to their blood sugar levels and help them control the disease, while simultaneously recording information for their doctor’s analysis. Expect to see an expansion of these types of devices that use big data and AI to make better real-time recommendations. If nothing else, healthcare can learn from that example.